After our wonderful stay in the heritage fort we headed to Jaipur which is known as the Pink City. Apparently when Prince Charles was to visit, the King ordered the town to be painted pink and it has been kept that way ever since. Whilst being more terracotta than pink, it was quite unique, especially as we saw elephants wandering around the streets amongst the markets, motorbikes, cycle rickshaws and vehicles. Before checking into our hotel which was Wall Street Hotel and probably the most Western hotel we had stayed in, we visited the amazing Amber Palace. 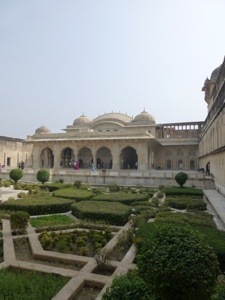 It was a fort hilltop complex and quite amazing with hall of mirrors (2nd largest in the world), the place for elephant fights and multiple rooms for the concubines. Our guide was very informative and once again passionate about the heritage. 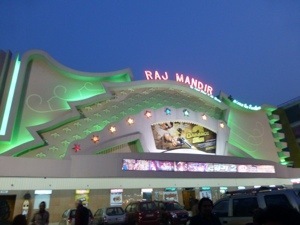 Tonight we were treated to a Bollywood movie at the Raj Mandir Complex which is one of the most famous cinema complexes in Asia. The foyer was Art Deco in style and the movie, Da Bang 2 proved to be a lot of fun. It was an interactive experience whereby you clap, cheer and dance along with the big dance numbers and whilst it was in Hindi, the plot was rather thin so easy to follow. Following the movie we walked to a nearby restaurant for dinner. As tourists, we were asked to evaluate a wine that they were considering adding to the menu. It was a white wine and although served warm, it was ok and we gave it the thumbs up!! One thing we have noticed is that Indians eat quite late and it is common to have dinner up to 11pm when all we want to do is go to sleep!! The next morning we caught a cycle rickshaw to the centre of the old town and visited Jantar Mantar (the observatory), City Palace and walked past the Hawa Mahal (Palace of the Winds) which is reportedly India’s second most photographed building after the Taj. Lunch was at LMB which is famous for its sweets so we sampled the Kulfi which was delicious. Dinner tonight was a meat feast as we went to a rooftop restaurant and had chicken kebabs which were also delicious. 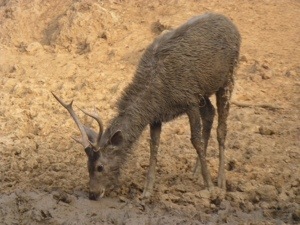 Next stop was Ranthambore National Park where we would once again go in search of tigers. This National Park is one of the biggest tiger reserves in India but we were not lucky enough to see any tigers. We saw plenty of bird life, peacocks and peahens by the dozens and numerous spotted deer and Samba Deer. On the way out of the reserve, a leopard was spotted by a couple in our group but you had to be quick to get a glimpse of the tail! Tonight we were in for a treat as we were entertained by a local music/dance group who got us up and dancing during our pre-dinner drinks. A wedding was being held next door and we could watch the whole thing from our rooftop vantage point. It is quite an ordeal with marching bands, elephants, processions, buffets and dancing and of course, loud music! The wedding started at 9.00pm with the exchange of garlands and continued on long after we were tucked up in bed! Bundi is known as the Blue City as all the buildings are painted blue. Our guided walk through the village was very interesting as we explored the markets and the local dentist who were setup as a stall on the footpath, with dentures and their tools of trade on display! We decided not to have a checkup but took a photo or two. A cow had parked itself in front of the dentist as well – perhaps it was waiting for a filling!! Cows, dogs, goats, monkeys and squirrels are everywhere and all get mixed up with the traffic and everyday life of India. 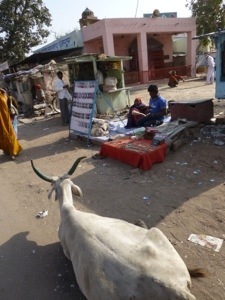 Cow dung is collected and made into patties for burning and you often see stacks of them on the side of the road. We walked to Bundi Palace which gave us great views of the town and had some excellent original paintings. We also visited the baoris (step-wells) along the way which is where the women used to come to collect water and gossip.